​Beyond Talamanca refers to contributions made to nature, people and sustainability in places outside of ANAI’s geographic focus on the Atlantic slope of the Talamanca mountain range. Conceptually, it refers to actions relating to the national or global dimensions of the biodiversity and human wellbeing crises. ANAI has never had a ‘program’ to work beyond the South Caribbean region of Costa Rica. With the exception of several learning exchanges, the association has never had, nor sought, funding to support this. It has mostly been realized with the volunteer time of members and staff. Nonetheless, ANAI has always had a deep interest in sharing its experiences and supporting others’ efforts to address the biodiversity and human wellbeing crises. c) Help people develop their own capabilities and their own voice. This has guided both the work in Talamanca and participation with the national and international community. It guides the calculus of which activities and relationships are given investments of scarce time and resources. Sometimes an urgent strategic need leads to getting involved in something beyond Talamanca, like dams and other mega-projects threatening the integrity of La Amistad International Peace Park in Panama, and recent missions to evaluate its World Heritage Site status. Other times it is because of the opportunity to support others working toward the same mission of integrating biodiversity, wellbeing and sustainability, like ANAI’s 25 year commitment and leadership in one of the world’s best national-level community-based sustainable development programs, the CR-SGP. Sometimes these opportunities arise during the normal course of work. The first instance came when ANAI was working to create the Gandoca Manzanillo Wildlife Refuge, and the team had the chance to meet and then support a small group of Panamanians working to protect what is now the San San Pondsak Wetland of International Importance. Today these two wildlife refuges form a 30,000 hectare bi-national conservation area joined by the border along the Sixaola River. Another example is the training and experience in community-based sea turtle research and conservation shared with more than 600 volunteers and interns a year, many of whom went on to do important work in development and conservation around the world. Within the time and resource constraints of a small NGO with a challenging agenda, team members participate in carefully chosen events to share experiences and lessons learned. 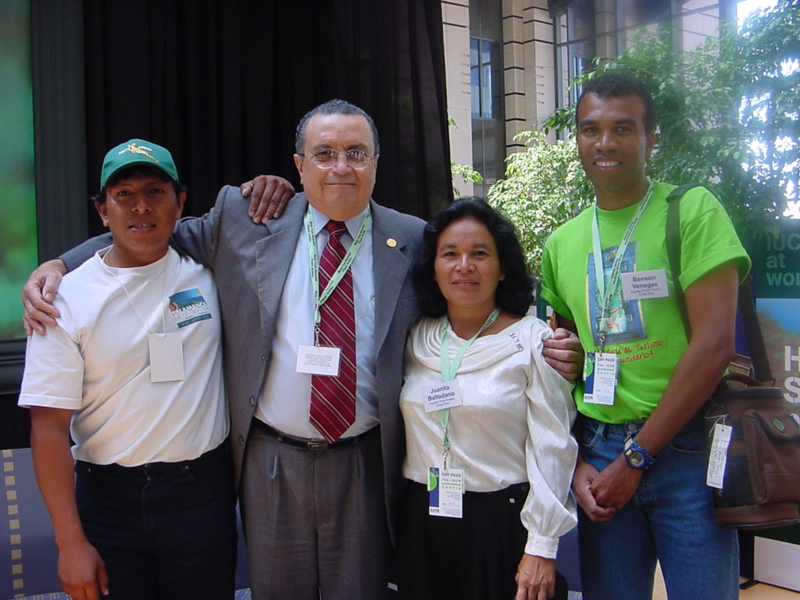 Examples range from an international congress of Latin American grassroots groups working to keep their rivers free flowing and healthy, to the UN Global Leadership Conference on implementing the Millennium Development Goals, to the COMDEKS Global Workshop evaluating the impact and lessons learned of the Satoyama Initiative’s integrated landscape conservation and development programs in 17 tropical countries. About once a year, ANAI has been able to host international learning exchanges. Examples include an Indigenous Teachers Sustainable Development Conference with participants from Brazil, Ecuador, Colombia, Panama and Costa Rica, and a Leadership for Community-Based Sustainable Development Exchange with participants from 8 Latin American and Caribbean countries. ​Perhaps the most important contributions have come from a few cases in which an opportunity to make a strategic contribution was identified, followed by a long term commitment as the opportunity grew. These include the Costa Rican Small Grants Program for community-based conservation and sustainable development, and the UN Equator Initiative, which ANAI has supported in different ways since being awarded the first Equator Initiative Prize in 2002. Supported a diversity of organic agriculture growing, processing and marketing initiatives. Supported the creation and consolidation of more than 30 indigenous and campesino community tourism initiatives. Supported the reforestation of degraded areas with native tree species. Put into practice a landscape-scale soil conservation initiative in Costa Rica’s two most degraded watersheds. Pioneered the creation of sustainable community fisheries areas all along the country’s Pacific coast. Supported joint conservation and development initiatives of protected areas and their surrounding communities. Played a leading role in the consolidation of Costa Rica’s Program of Biological Corridors. Supported the creation, training and consolidation of numerous volunteer fire brigades in communities all over the country, contributing to the protection of thousands of hectares of forest.